The city of Cambridge is old. The University of Cambridge was founded in 1208, but the town dates from centuries earlier. We have the remains of a motte & bailey castle overlooking the town. It was built in 1068 just two years after the Norman conquest. But in fact there are Iron Age settlements in the neighbourhood that are around 3500 years old. This is around the time the earliest Indian texts were composed. Romans and Saxons also lived here at different times. Cambridge was under the Danelaw in the 9th century. I grew up in New Zealand where human occupation is thought to have begun ca 1000 CE with the arrival of the first Pacific Islanders, probably from what are now known as the Cook Islands. European's began arriving some centuries later beginning with Abel Tasman from Zeeland, Holland (hence the name), and followed by James Cook from Britain. Most of the evidence of human occupation of New Zealand is only a century or two old. Down the road from me in Cambridge is a church built when the Māori were washing up on the shores of New Zealand. In New Zealand we think 100 years is a long time. In Britain we live with much longer roots into the past. But we also have reminders of transiency. Some of the most evocative of these are the various cemeteries dotted around. 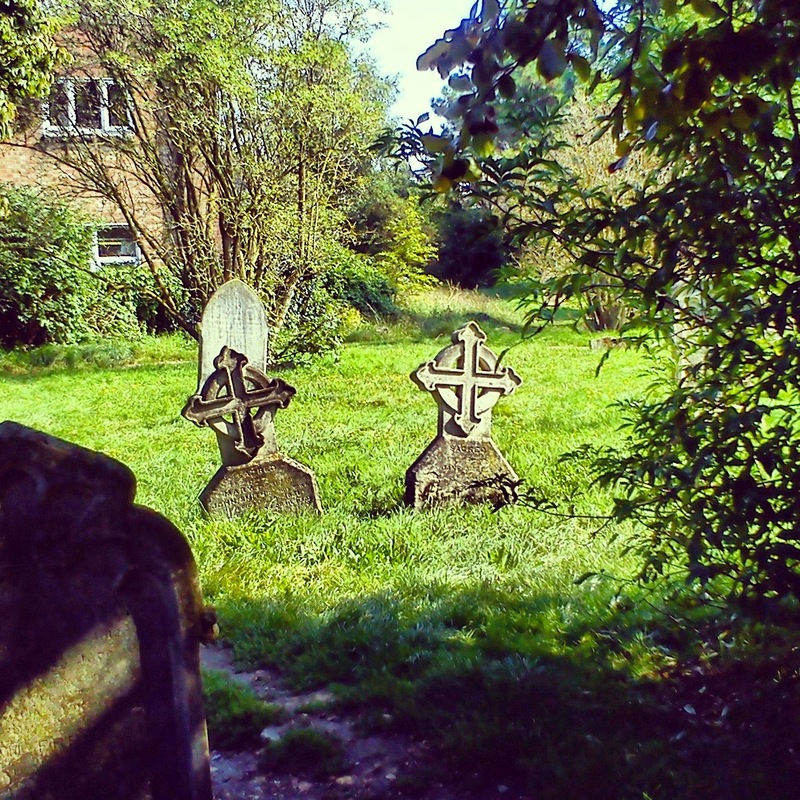 In Britain each church parish had their own cemetery, though some, like the one I'm going to discuss, were shared between parishes. Many of these are now closed, full of the dead, and are slowly being turned into parks. Even headstones moulder given centuries. 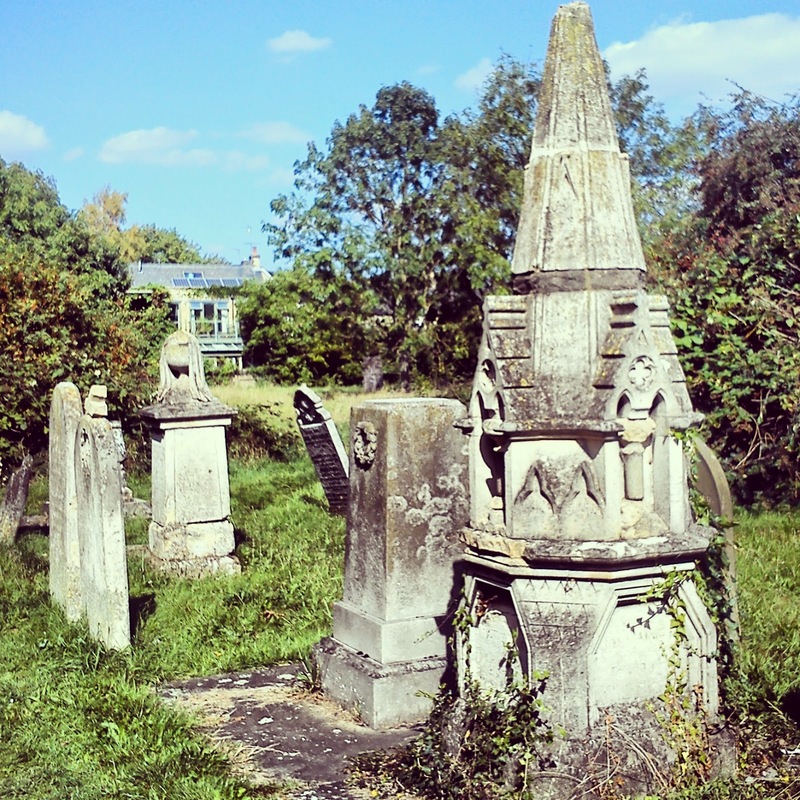 I particularly enjoy Mill Rd Cemetery. It's quite large and in a quiet part of town so that one can sit there and have a sense of being isolated from the busyness and business of the city. There are many mature trees and smaller trees, shrubs, brambles (if you will eat berries that grow in a cemetery they are juicy and ripe at this time of year). 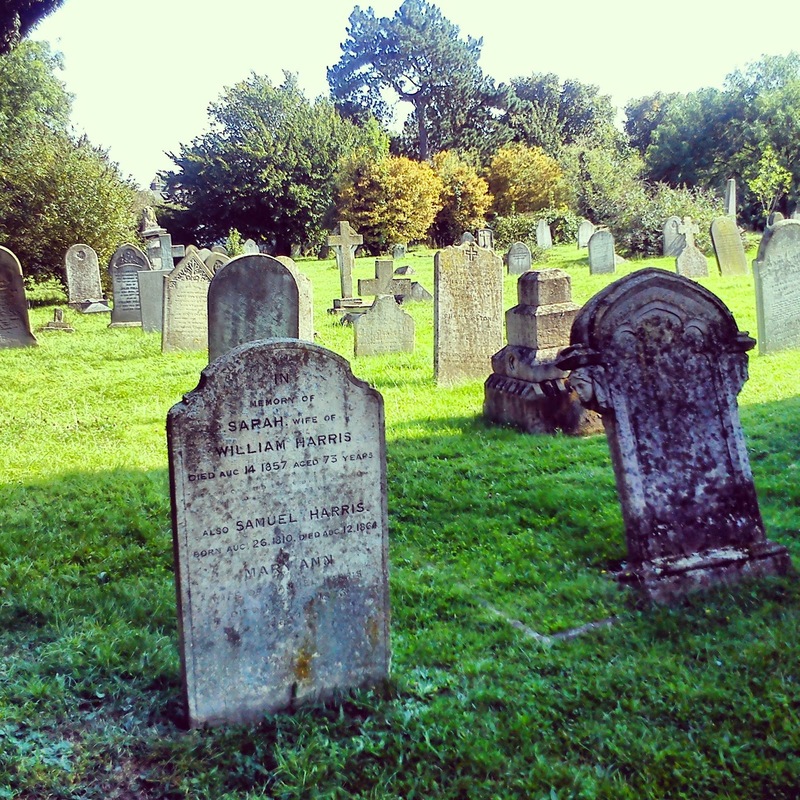 Mill Rd Cemetery was consecrated in 1848 and closed in 1949 and thus neatly spans the last century of the British Empire. By 1848 Britain was starting to become seriously wealthy on the back of the Empire, so many of the grave markers from that time are rather ostentatious by today's standards. And yet some stones are now so weathered that the names are unreadable. Acid-rain due to fumes from industry and motorised transport has ablated the sandstone headstones, though marble fairs better. A couple of events of savage vandalism damaged many gravestones. 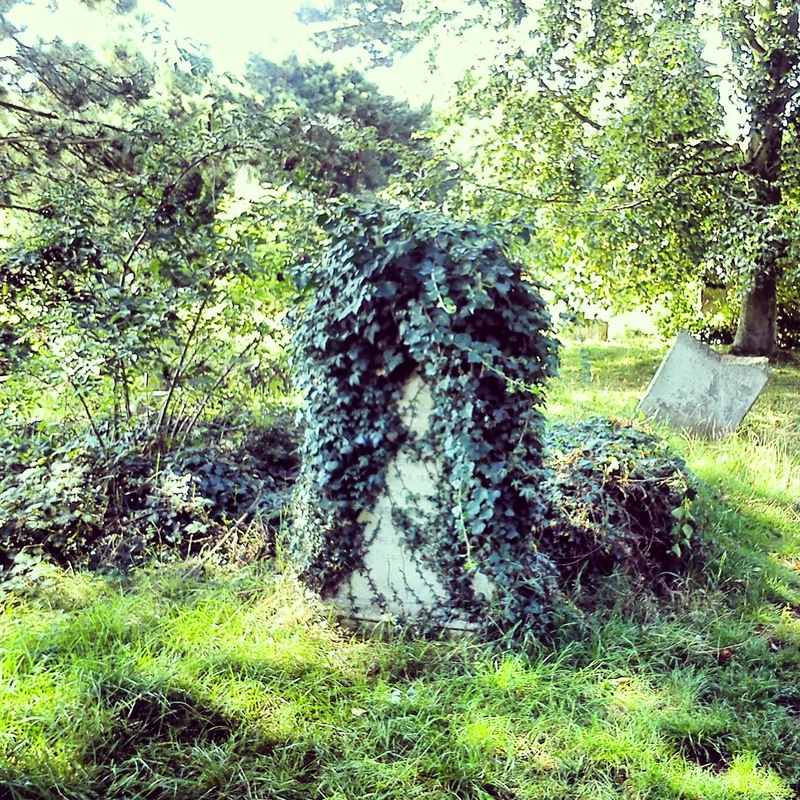 The cemetery is slowly giving way to nature. In fact the management of the cemetery are helping nature out by planting trees. There are a number of paths through the cemetery. However, after some thought I realised that not all of them are official. Some of them are simply shortcuts that have been worn down by use. In fact in some cases the shortcuts go right over graves. When it rains all the paths flood. If there's a lot of rain people go around the puddles and walk new paths into the grass. Again these frequently go over and across graves with apparently no hesitation. These old graves are not as sacred as new graves, if they are sacred at all. I find this aspect of the cemetery troubling. 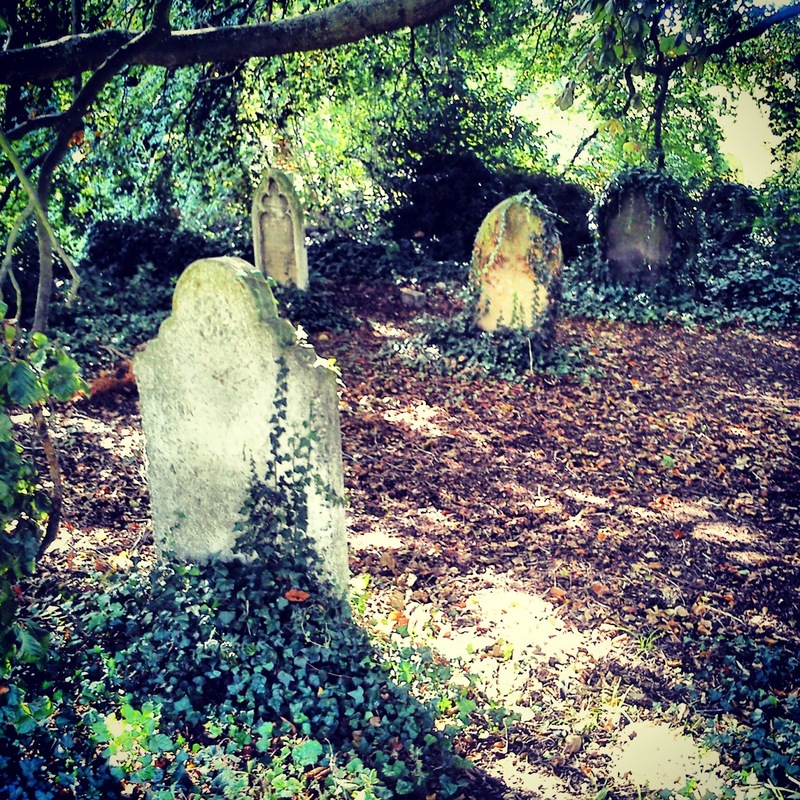 But then after a few hundred years we treat graves as curiosities to dig up and examine. Where is that line in time? Another aspect for contemplation is that the cemetery regularly attracts groups of homeless people and/or alcoholics. In dry weather it's a pleasant place to spend time. And often-times people sleep out under the bushes in out of the way places. At one point a regular colony became established. But this is Cambridge and such things are not tolerated here, so they were moved on. Watching these people, whose lives and health are wrecked by drugs, alcohol, or fate, is salutary. I dare not stare for fear of inviting confrontation, but I do think that I could so easily have ended up amongst them. I gave up alcohol more than 20 years ago, before it wrecked my life, but had I waited a little longer it might have done a great deal more damage than it did. Both my grandfathers and at least one of my great-grandfathers were alcoholics. One of my uncles died of an accidental morphine overdose, another was a junky who died from a stab wound to his cirrhotic liver that a healthy man would have survived. There are other addicts in the family. I'm not so different from the dishevelled and unwashed street-people drinking their cheap, ultra-strong beer for breakfast. Having shouted conversations, not comprehending or caring. But what really strikes me about the graves in Mill Rd Cemetery is that except for one or two, none are tended, kept clear of weeds or offered flowers. Descendants have forgotten their ancestors. And this in a town with more than averagely memorable people. Even holding relatively high office in the town is no guarantee of being remembered. Two or three generations after we die we'll, most of us, be forgotten. We think all the stuff we're doing today is so important. But most of it leaves no lasting impact on the universe. Even if we do manage to pass on our genes, our families forget us. We cease to exist even in memory. History has a very bad memory. Most of what we think of as important today is entirely inconsequential in the long view. All those decisions we agonise over for hours, days and months, they won't be given a moments thought in fifty years. Even if we have kids, our graves will go untended. Our cemetery will eventually be closed and turned into a park. Vandals or acid rain will destroy our modest headstones. People will casually walk over our graves to save a few minutes or avoid a rain-filled puddle. So the question I find myself asking is this. "What will be my legacy?" OK I've written some books and they are in libraries. But they're printed on acid paper and won't last more than a century. And there were only ever a few dozen copies of each. Perhaps Google will leave this blog to stand for years after I die and stop updating it? Who knows? Maybe they'll start deleting cob-websites after a period of inactivity to save a little bit of money? In fifty years it's not going to matter much. Maybe my academic publications will have a longer life (if I ever get my Heart Sutra material published it might last a century). Does it make sense to even think in terms of legacy in this light? And if not legacy, then on what standard do we assess the value of our lives. One can see how life after death holds it's appeal for the majority of people. Or should we adopt the YOLO "live in the moment" maxim? In its hedonistic or contemplative aspects. My experience suggests that moments are only bearable if we know they're going to end. One has to have a longer perspective than just one moment in order for any given moment to be tolerable. In the moment, one is utterly alone. In perspective one is intimately connected. If in the long term we don't make a difference or matter, then perhaps in the short term we matter to the extent we experience our connectivity? Being in a dynamic web of relations is fundamental to being human, perhaps it is the ultimate source of meaning also? I don't have answers to these questions and I've become distrustful of people who have easy answers. It seems to me that perhaps contemplating such things is a value in itself without ever coming to an end point. If I ask myself these questions then at least I'm not stumbling blindly through my life with no sense what why I do anything. And one gets the sense that so many people are blind. So I continue to visit the cemetery. I sit and enjoy the environment, read, drink ginger beer, watch the people, think about the dead, and wonder about my place in the universe. It's hardly the ancient cremation ground practice, but it seems much better than a church or temple as a place for contemplation (weather permitting). Pics from Mill Rd, Cemetery. I enjoy Fentimans and Fever Tree ginger beer. Ginger beer, especially these fairly dry varieties, is a great alternative to alcoholic drinks for those who still like the feel of a bottle in their hand. If more of us drink it, the shops & pubs will stock it. Give it a go. The Politics of Evolution and Modernist Buddhism.